Superbike School. SSL has over a number of years been responsible for operating the Ducati UK Roadshow throughout the UK as well as a number of successful track events. The Silverstone circuit neighbours will begin their partnership immediately and Ducati UK will supply the school with the flagship 1199 Panigale, the new and highly acclaimed 899 Panigale and the soon to be launched Monster 1200. The bikes will be available to hire for students preferring not to use their own bikes and wishing to experience a Ducati on track and will also be used by the school instructors. The first opportunity for students to experience a Ducati on a California Superbike School day will be April 27, 2014 at the Stowe Circuit, Silverstone. The agreement is for the UK specifically and there will be a total of 15 California Superbike School dates in the UK this year to choose from. "We have worked with Superbike School Limited for a number of years and I have always been impressed with their professionalism and passion for what they do. Ducati considers rider training to be very important and in the UK we have supported the road based Bike Safe programme for some time and so it is a natural progression to support one of the leading exponents of track based advanced training. I am sure using a Ducati on the school will prove very popular amongst students and will expose many people to the thrill of riding a Ducati. 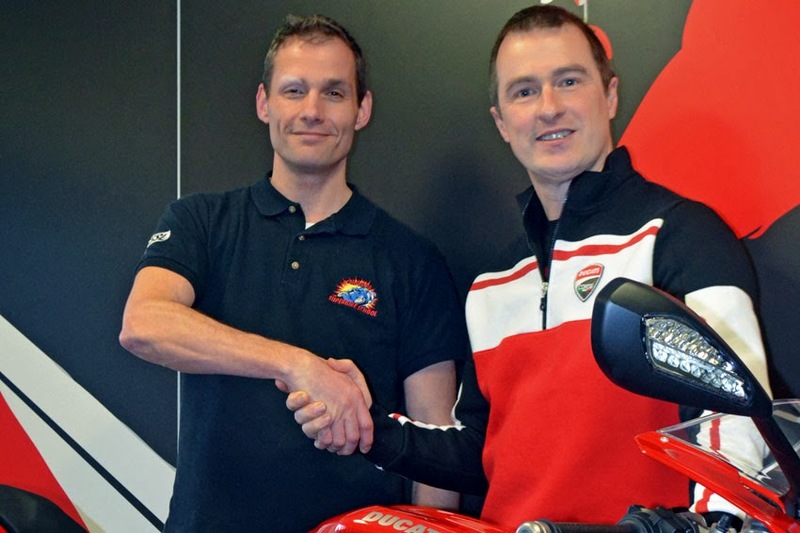 We are certainly looking forward to this new venture," said Tim Maccabee, Managing Director, Ducati UK. "I am very excited to have the opportunity to work with Ducati on the California Superbike School. I have been involved with Ducati for over 3 years with their Roadshows and I have become a big fan of the brand. Their range is one of the most technologically advanced on the market and the traction control and riding modes add an important element of safety to the school. Welcoming a premium brand such as Ducati to the California Superbike School can only encourage more people to join us in honing their skills," added Richard (Badger) Brown, Executive Director and Rider Coach, California Superbike School.